Blanche Calloway, late 1920s or early ’30s. Pictured in Of Minnie the Moocher and Me. 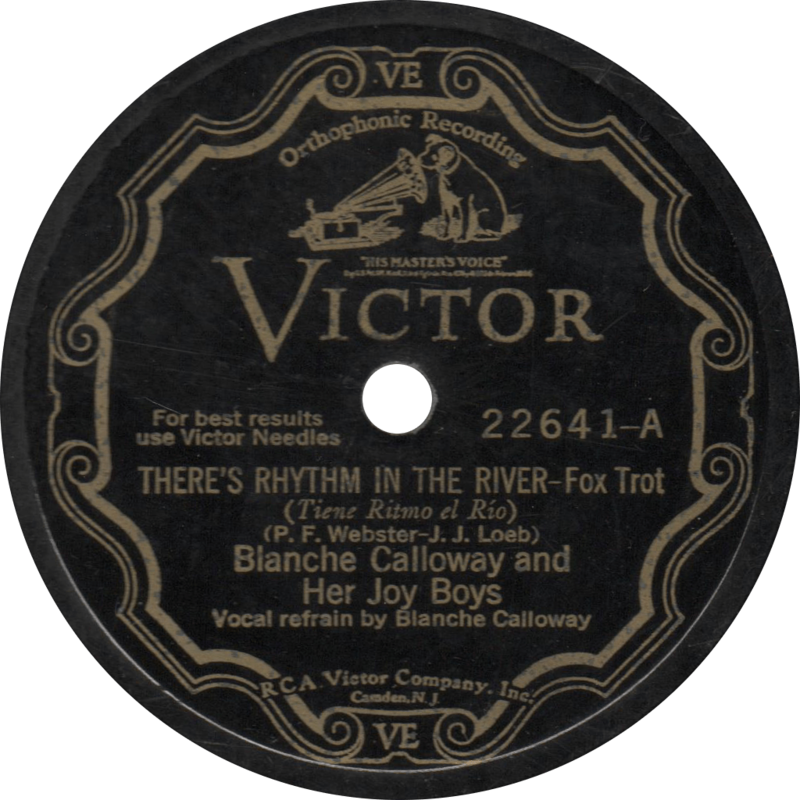 We last heard from Cab’s underappreciated sister Blanche Calloway the previous time we celebrated her birthday, with her “There’s Rhythm In the River”/”I Need Lovin'” with Andy Kirk’s band. Now the time of year has come around once again that we celebrate the birthday of the late Blanche with her music. As I’ve already gone in to some detail on Blanche’s life in the aforementioned post, I won’t rewrite my biography of her here. When the band calling themselves “Blanche Calloway and her Joy Boys” began recording for the RCA Victor Company on March 2, 1931, it was essentially as a pseudonym for Andy Kirk’s Twelve Clouds of Joy, fronted by vocalist Blanche. Not long after that session, before their next, Blanche tried to take over leadership of the Twelve Clouds of Joy for her own. Andy Kirk however, would have none of that, and so Blanche was left to put together a band of her own, and that she did. With Kirk band trumpeters Edgar Battle and Clarence Smith still along, Blanche assembled a new “Joy Boys”, with a few future swing era stars—Cozy Cole and Ben Webster most notably—sitting in along the way. The new Joy Boys, with occasional changes in personnel, continued to record into the middle of the 1930s, cutting seventeen sides for Victor in 1931, four for the American Record Corporation in 1934, followed by a fifth unissued recording the next year, and four more for Vocalion in 1935. The organization come to an end in 1936, when Blanche and a band member were locked up for disorderly conduct in Yazoo, Mississippi after trying to use a whites only restroom, and another bandmate ran off with all their money. 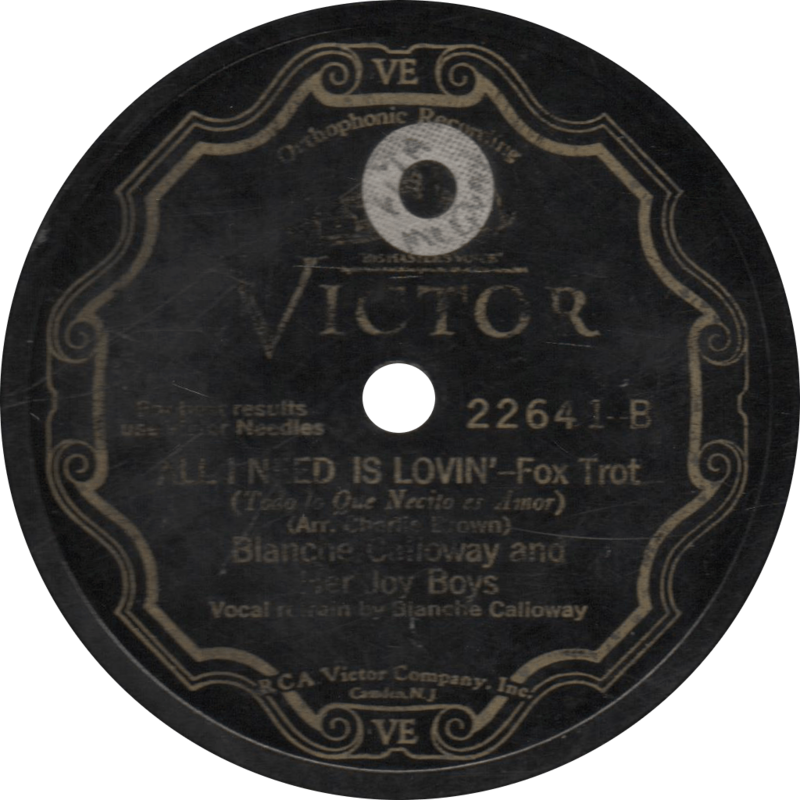 Victor 22866 was recorded on November 18, 1931 at the Church Building studio in Camden, New Jersey. It sold a mere 3,233 copies. Blanche’s Joy Boys are made up of Henry Mason, Clarence E. Smith, and Edgar Battle on trumpets, Alton Moore on trombone, Ernest Purce on clarinet and alto sax, Leroy Hardy on alto sax, Charlie Frazer on tenor sax, Clyde Hart on piano, Andy Jackson on banjo, Joe Durham on tuba, and Cozy Cole on drums. 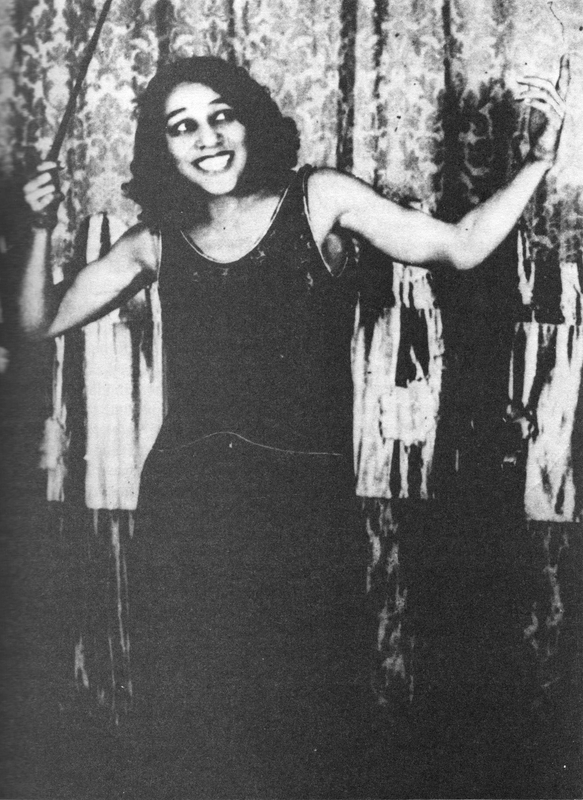 First, Blanche sings one of her characteristic songs, her own composition, “Growling Dan”, featuring a mention of her brother’s famous Minnie the Moocher. 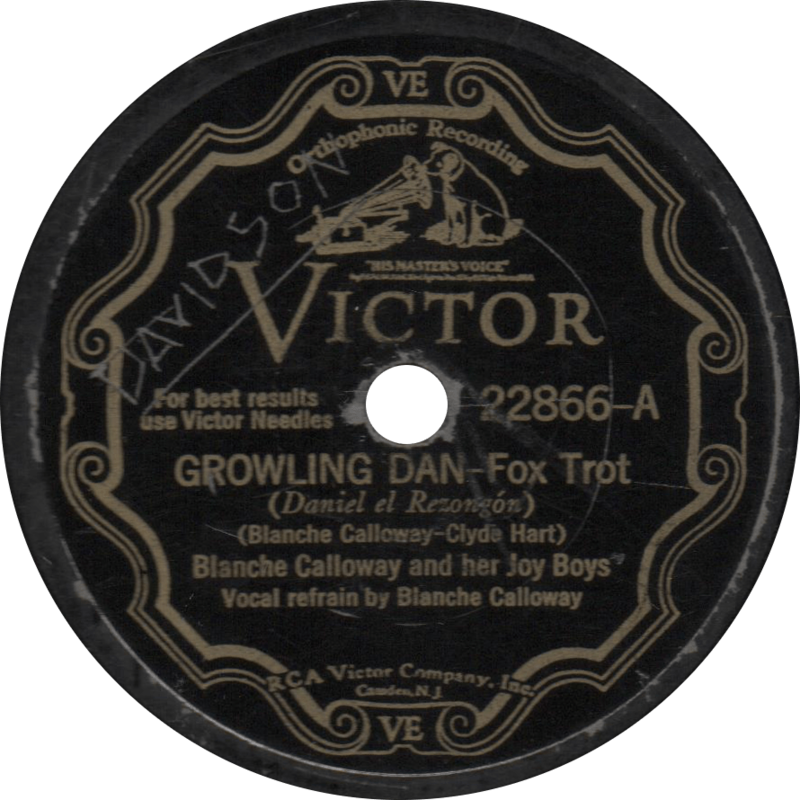 Growling Dan, recorded November 18, 1931 by Blanche Calloway and her Joy Boys. 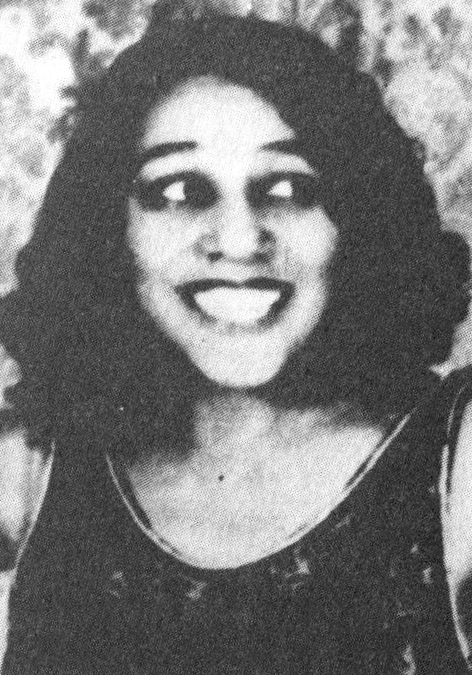 On the flip, she sings a blues song popularized by Bessie Smith, the Clarence Williams and Hezekiah Jenkins composition, “I Got What it Takes (But it Breaks My Heart to Give it Away)”. 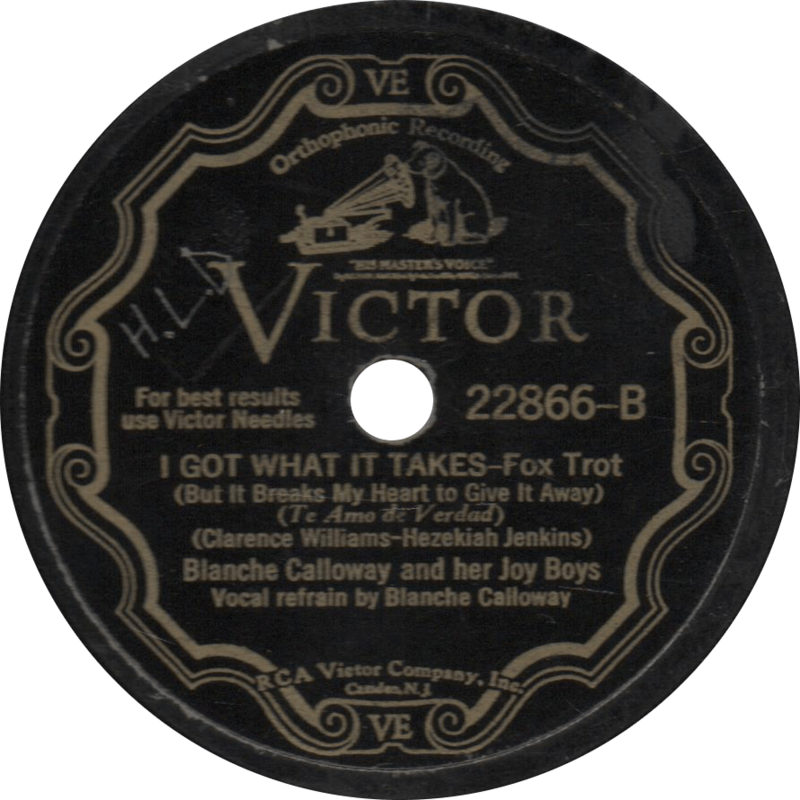 I Got What It Takes (But it Breaks My Heart to Give it Away), recorded November 18, 1931 by Blanche Calloway and her Joy Boys. 115 years ago today, the prolific bandleader Ted Weems was born. He had hits with “Piccolo Pete” and “Heartaches”, and co-wrote such songs as “Oh, Mo’nah” and “Jig Time”. In commemoration of the occasion, here is his first record. Weems was born Wilfred Theodore Wemyes on September 26, 1901 in Pitcairn, Pennsylvania. He began his musical path when he entered a contest to win a pony, but wound up with a violin instead. He later took up the trombone as well. Weems organized his first band while in school, and did so again in college with a more professional group that took professional engagements at hotels and restaurants. In 1921, Weems’ band played at the inauguration of President Warren G. Harding. The Weems band made their first record in 1923 for the Victor Talking Machine Company, with whom they continued to record for the next ten years. After leaving Victor, the Weems band recorded for Columbia, and then Decca. Like many bands and musicians of that day and age, much of their success was found on the airwaves. During the war, Weems joined the Merchant Marines and led their band. After a period of relative dormancy, Weems’ popularity was revived in 1947 when a North Carolina disc jockey played his uptempo rumba recording of “Heartaches” from 1933, which was met with unexpected enthusiasm from the public. After that unexpected success, Victor reissued the record, and Decca followed suit with a reissue of their recording of the same tune that Weems had cut in 1938, both of which became hits. Weems organized a new band, which stayed together until 1953. Ten years later, in 1963, Ted Weems died of emphysema. 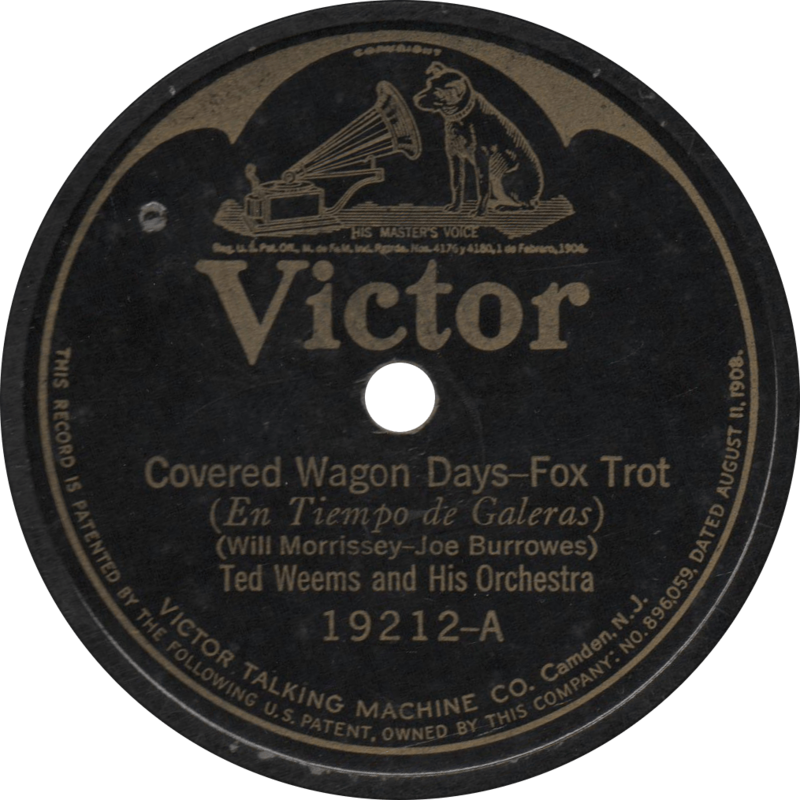 Victor 19212 was recorded on November 20, 1923 in Camden, New Jersey, the first sides ever cut by Ted Weems’ Orchestra. Both sides were originally made as tests, but must’ve impressed the higher-ups, as they wound up being assigned masters and issued. The band consists of Art Weems and Paul Creedon on trumpets, Ted Weems on trombone, Norman Nugent and Walter Livingston clarinet, soprano sax, alto sax, and bass sax, Francis Buggy on clarinet, soprano sax, and tenor sax, Charles Gaylord on violin, Reuel Kenyon on piano, Weston Vaughan on banjo, George Barth on tuba and string bass, and Cecil Richardson on drums. First up, Weems’ band plays the western-themed “Covered Wagon Days”. Covered Wagon Days, recorded November 20, 1923 by Ted Weems and his Orchestra. On the reverse, they play a superb instrumental rendition of the old standard “Somebody Stole My Gal”. 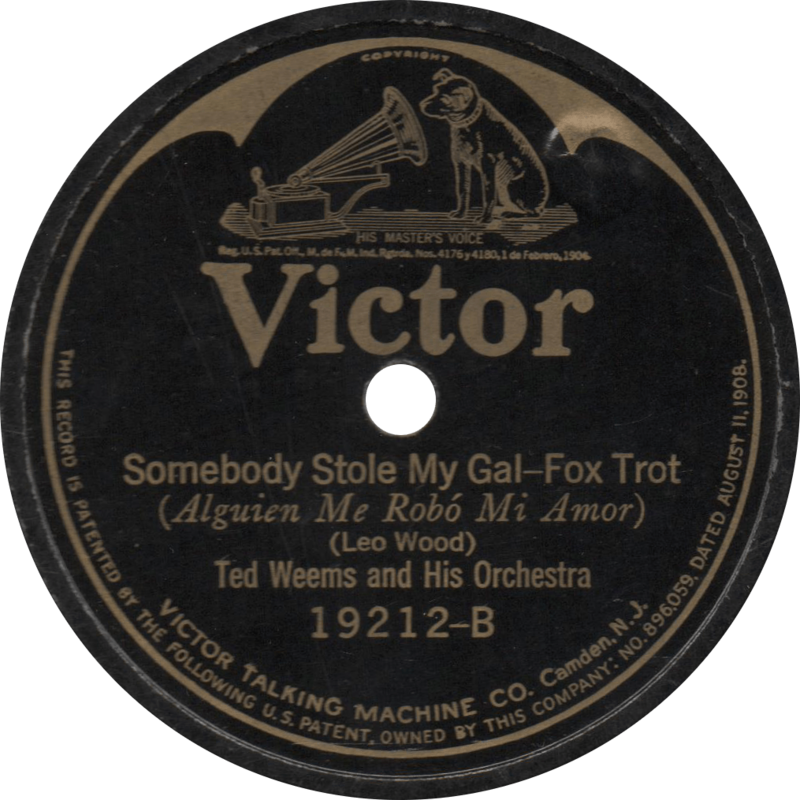 Somebody Stole My Gal, recorded November 20, 1923 by Ted Weems and his Orchestra. With all due apologies for Old Time Blues unintended ten day hiatus, we hope now to return to regular posting. And what better a note to return on than these great classics by the one and only Carter Family, in honor of Sara Carter, born on this day 118 years ago. Sara Elizabeth Dougherty was born in Copper Creek, Virginia on July 21, 1898 to William and Nancy Dougherty. In 1915, she married Alvin Pleasant (A.P.) Carter, with whom she had three children, Gladys, Janette, and Joe. In the 1920s, Sara began performing traditional folk songs with her husband and cousin Maybelle as the Carter Family. In August of 1927, they came to Bristol, Tennessee to record for the first time in a series of sessions organized by Ralph S. Peer for the Victor Talking Machine Company. At the Bristol Sessions, the Carter Family recorded six sides, four on the first and two on the second of August. Their first record, “Poor Orphan Child” and “The Wandering Boy” was issued on Victor 20877 in December of 1927, with considerable success, and their second, “Single Girl, Married Girl” and “The Storms are On the Ocean” on Victor 20937, found even greater popularity. In May of 1928, they ventured to Victor’s facilities in Camden, New Jersey for another session, with many more coming thereafter. As the group reached their peak, Sara’s powerful singing—initially quite high, and later maturing into the deep, low voice for which she was known—provided a heart and soul to their music, perfectly complimented by Maybelle’s guitar playing. In 1932, the Carters experienced marital strife, when Sara began having an affair with her A.P.’s cousin Coy Bayes while her husband was away on one of his many long trips to “discover” new material for the family, separating him from Sara for weeks or months at a time. They divorced in 1936, but the original Carter Family stuck together until 1943, after which Sara married A.P.’s cousin and moved to California, where she retired from music. A.P., Maybelle, and the kids returned home to Maces Spring, Virginia, where he opened a store, and she continued to pursue a musical career. Sara later made a small comeback during the folk revival of the 1960s with Maybelle, but she never regained what she had in the old days, and indeed she probably never wanted to. Sara Carter died in California at the age of 80 on January 8, 1979. Montgomery Ward M-4225 was recorded in two separate sessions, the first on May 9, 1928, and the second on October 14, 1932, both in Camden, New Jersey. The trio sings while Sara plays autoharp and Maybelle plays guitar. They were originally issued on Victor 21434 and 23776. This Montgomery Ward issue was pressed from the original masters. The Carter Family’s classic rendition of the old standard “Keep On the Sunny Side” could be compared to Jimmie Rodgers’ “Blue Yodel” as a song that became indelibly associated with them, serving as their theme song when they performed on border blaster radio, and later inscribed as the epitaph on both Sara and A.P. Carter’s gravestones. Also like Rodgers’ “Blue Yodel”, it was recorded at the Carters’ first session after the Bristol Sessions. 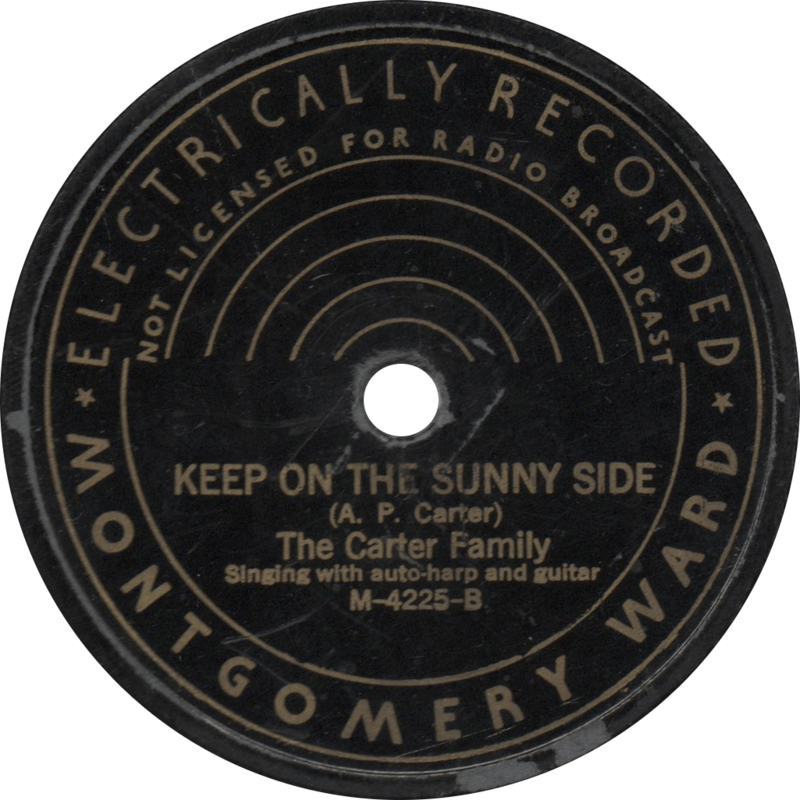 Keep On the Sunny Side, recorded May 9, 1928 by the Carter Family. “The Church in the Wildwood” is a song that I recollect fondly from my own childhood, and unsurprisingly the Carters’ rendition is a pleasure to hear. Fittingly, this side was recorded in Victor’s Camden, New Jersey church studio. 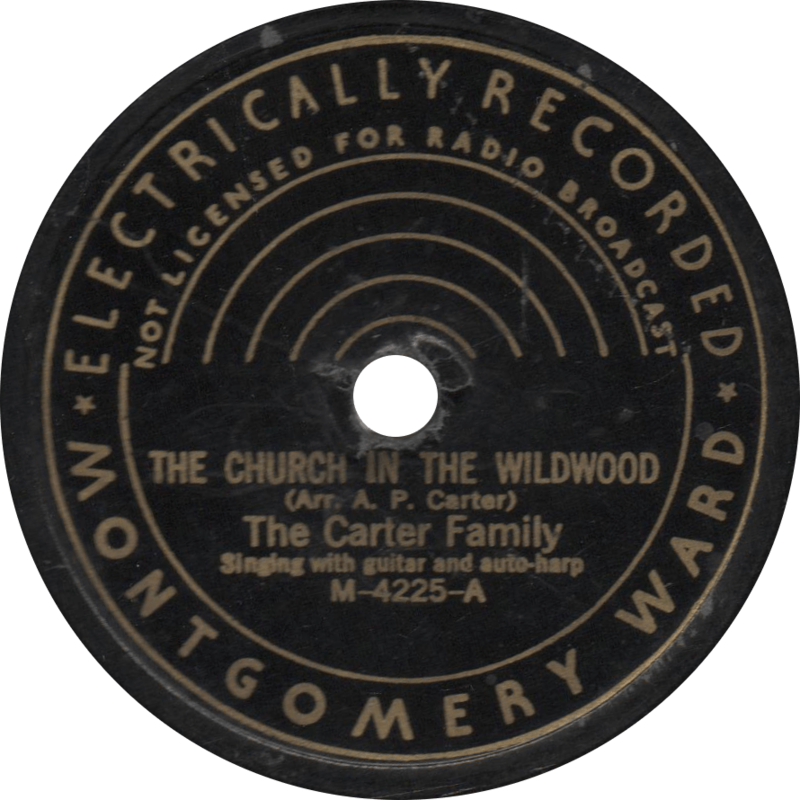 The Church in the Wildwood, recorded October 14, 1932 by the Carter Family. Updated on June 1, 2018. 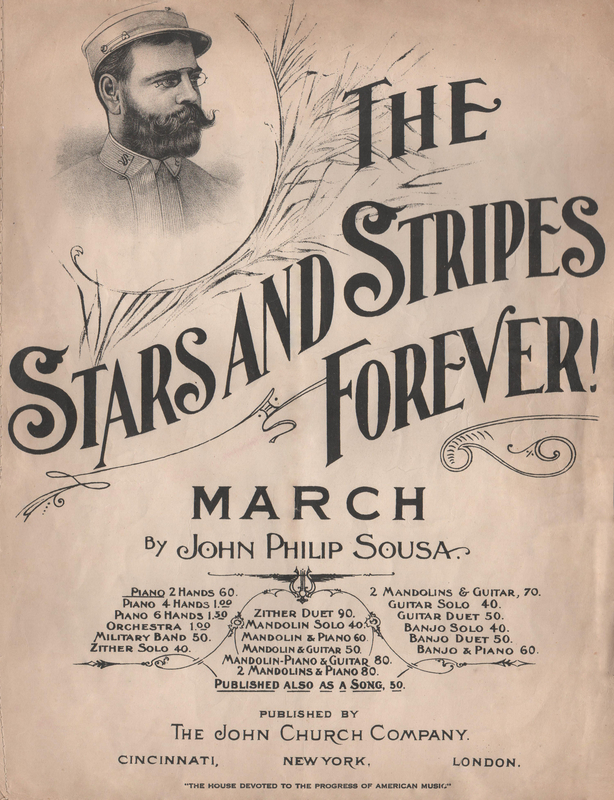 An early edition sheet music to “The Stars and Stripes Forever”, dating to 1897. On the Fourth of July, we celebrate the United States’ Declaration of Independence from England. This year’s Independence Day is a particularly important one, being the United States’ 240th. As such, it would only be appropriate to celebrate with patriotic music by America’s March King, John Philip Sousa. This year, Old Time Blues celebrates with John Philip Sousa’s own band playing a patriotic serenade. However, Sousa himself, who was well known for his distaste for “canned music” does not direct his band on this record. Instead, his protégé Arthur Pryor directs on the first side, and Victor’s musical director Josef Pasternack does so on the other. We also previously posted Sousa’s final composition, the 1932 “Century of Progress March”, written for the 1933 World’s Fair in Chicago. Records like this are sometimes hard to date, as Victor had a tendency to record multiple takes over the course of several years (or decades), all on the same matrix and catalog numbers. These appear to be takes 16 and 3, respectively. That would indicate that the “A” side was recorded on December 13, 1912, and the “B” side was recorded on November 9, 1920, both in Camden, New Jersey. The record was originally issued in November of 1910, and was cut from the catalog in October of 1926, when an Orthophonic version was released on Victor 20132, which remained in the catalog for an astounding thirty years. First, Sousa’s Band plays his great 1897 composition, the “Stars and Stripes Forever March”. 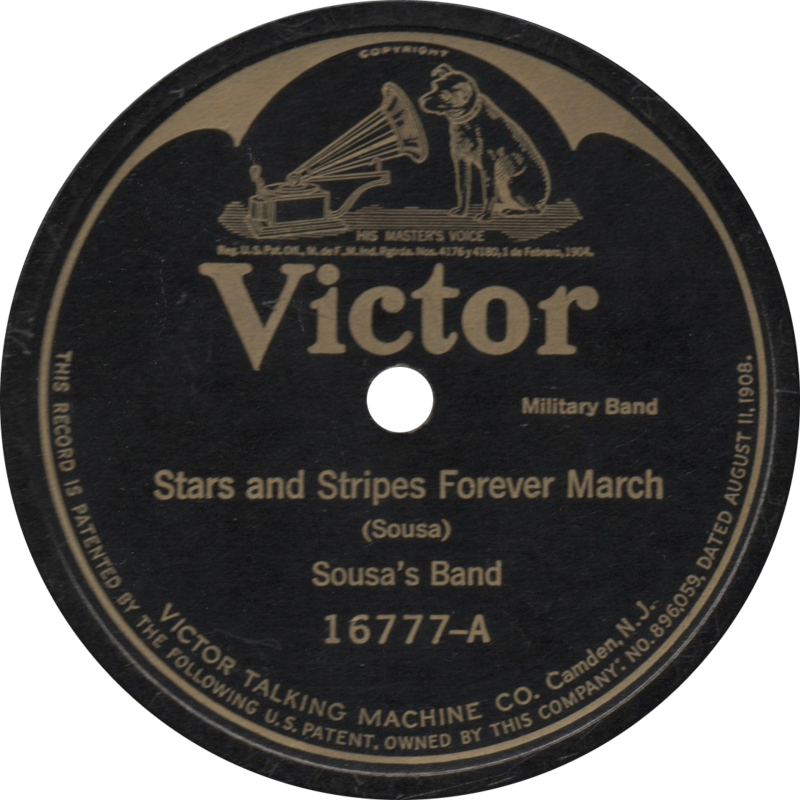 Stars and Stripes Forever March, recorded December 13, 1912 by Sousa’s Band. On the flip, it’s Sousa’s “Fairest of the Fair March”, composed in 1908 for the Boston Food Fair. 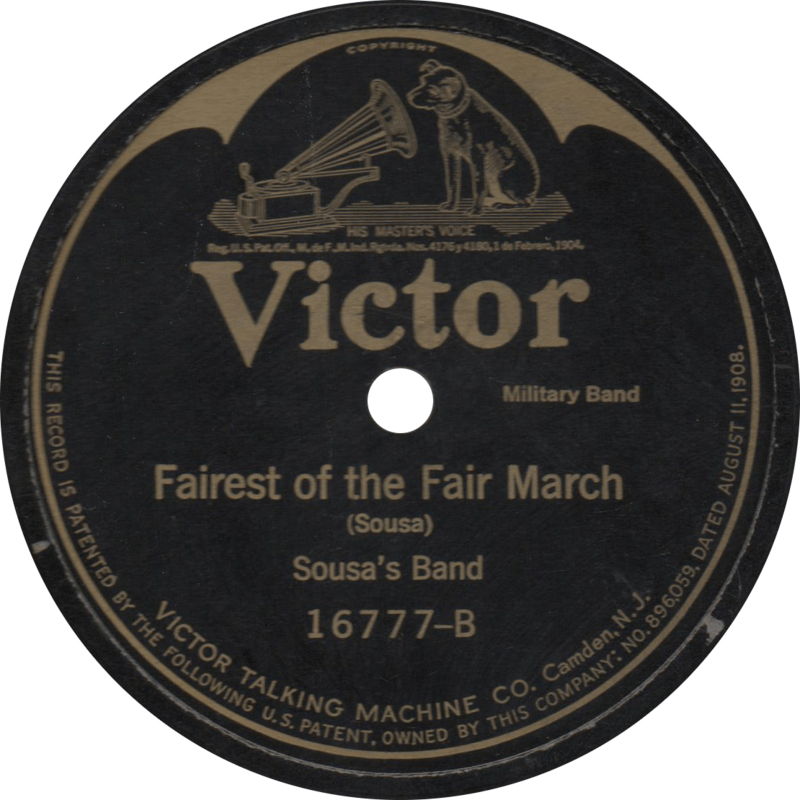 Fairest of the Fair, recorded November 9, 1920 by Sousa’s Band. Now there was old Al Dexter, he always had his fun. But with some lead, she shot him dead, his honkin’ days are done.